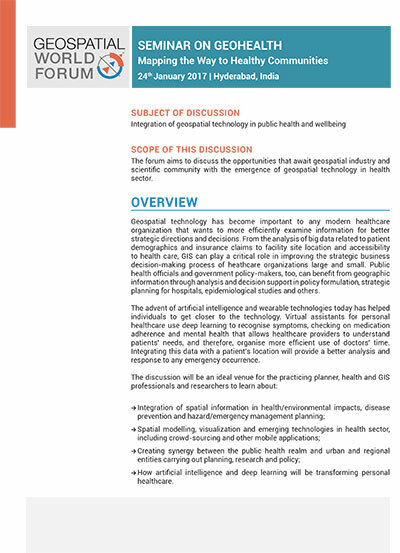 How will health and well-being be transformed by geospatial technology in the next 10 years? What are the opportunities for future entrepreneurs? Geographic information systems (GIS) and other geospatial technologies offer tremendous benefits for the health care industry. Whether used in strategic planning for hospitals, epidemiological studies by public health officials or policy construction by government agencies, GIS is important for accurate and nuanced analysis and decision support. GIS has become important to any modern health care organization that wants to more efficiently examine information for better strategic directions and decisions. From the analysis of big data related to patient demographics and insurance claims to facility site location and accessibility to health care, GIS can play a critical role in improving the strategic business decision-making process of heath care organizations large and small. Understanding the value of smart geospatial technologies in managing health resources, enhanced decision making, enhancing the efficiency of workflows, and improving the accessibility of information, an exclusive forum for health is being organized with the theme: "GEOHEALTH– "Mapping the Way to Healthy Communities" on 24th January as part of the Geospatial World Forum – 2017. It is an ideal venue for the practicing planner, health and GIS professionals to learn about access to and availability of community and health data sources, integration of spatial information in planning, best practices in creating active and walkable communities, health/environmental impacts, disease prevention and the built environment, hazard/emergency management planning, spatial modelling and visualization and emerging/applied methods and technologies including crowd-sourcing health related data and other mobile applications. Creating synergy between the public health realm and urban and regional entities carrying out planning, research and policy will be an integrated theme of the conference. The fields of Geospatial technology and public health & wellness are two areas that have never been combined, until a few years ago. Today there is a new emergence of research and inquiry into this new field of GeoHealth. In this session you will hear from leading international researchers more about this new field of knowledge and about latest trends in the monitoring, mapping and visualization of epidemics and diseases. Learn about how mapping and visualization contribute to the fight against the explosion of multi-resistant bacteria. Session II: How will health and well-being be transformed by geospatial technology in the next 10 years? What are the opportunities for future entrepreneurs? For several years there has been talk about space technology and Global Earth Observation. Perhaps it's time to start talking about "Global Human Observation" and small sensors that operate in our bodies. And what about the role of Artificial Intelligence. All these topics and more will contribute the future of the GeoHealth field. This session is open for researchers and experts to describe how geospatial technology and knowledge in a wider sense can contribute to better public health and more individual wellbeing, globally. We will discuss the interchange between researchers, innovators and entrepreneurs. We shall attempt to answer the following questions: How will health and well-being be transformed by geospatial technology in the next 10 years? And what are the opportunities for future entrepreneurs?